Digital talk box plug-in effect. 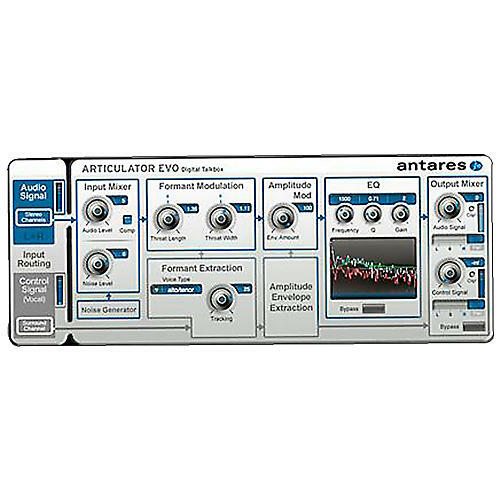 The ARTICULATOR Evo plug-in by Antares lets you add a classic talk box effect to your instruments. Use ARTICULATOR Evo to extract the formant and amplitude from any dynamic source, such as vocals, and apply it to another audio track. It's a perfect way to make guitars talk, synths scream, and special effects come to life. Whether you're looking for a cool way to add subtle vocal qualities to your instruments, highly creative vocal lines, or crazy special effects, ARTICULATOR Evo gives you the power and flexibility you need! Make your instrument do the talking with ARTICULATOR Evo. ARTICULATOR Evo authorization requires an iLok2 USB smart key and the ability to access ilok.com (on any computer).